Remember that cute viking fabric that I made into those little drawstring bags? I found another strip of it. But it wasn’t enough to make into a bag, unfortunately. I was going to have to combine it with another kind of fabric? What goes with vikings, though? How do you combine viking warriors with anything else? Floral prints? But how about a brick wall? If I make the bag tall enough, it will look like warriors peeking over the battlements of a tower, and that conveys the image that we’re looking for — not a bag, but a tower, not a small purse but a fortress. It becomes a thing of the imagination, as much as a physical object. I’d rather it was a stone wall, or maybe spiked logs, like on a rough-and-ready motte and bailey castle. That would make sense, after all. The vikings didn’t build too much in brick (they also didn’t wear horned helmets — not very practical in warfare, really). No matter. I found some brick fabric, and it matches pretty nicely with the vikings. 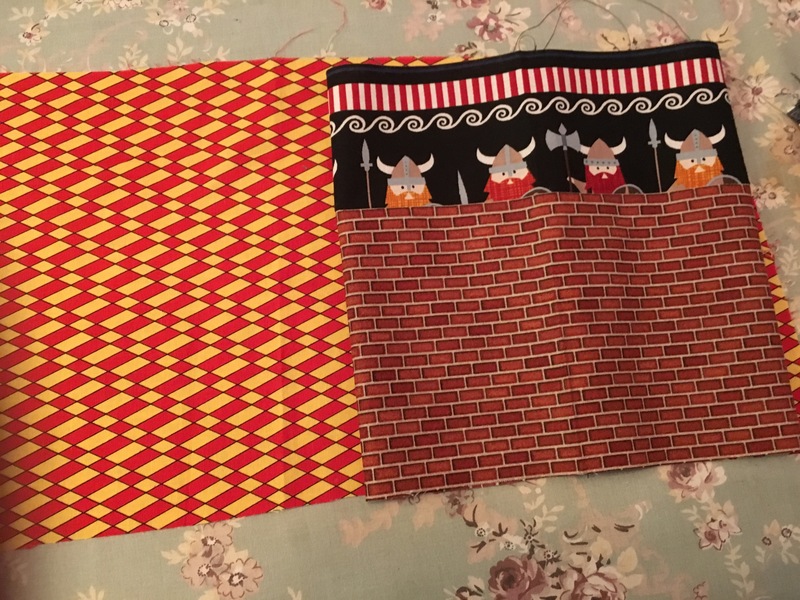 And then I found some other fabric that sort of resembled the Lord Baltimore colors in the Maryland flag… somewhat heraldic, though not TOO heraldic… not shields with lions and snakes and so on. That would have been a seriously lucky find, though, in an American fabric store. In general, though, we don’t really understand heraldry’s rules, so they often get used against us — in advertising, in snobbery and class warfare, and other ways, as well. That’s not really at issue here, though. What is at issue, for me, is how much of Makery in schools seems to be “making for the sake of making” — that students should simply be allowed to make whatever it is they want to make, full-blown from their imaginations. I don’t know that there’s anything wrong with just letting people make what they want to make, mind you — there’s benefit to that, and real results can emerge from allowing that spark of creativity. But I think there’s a place in Making for making with a purpose. 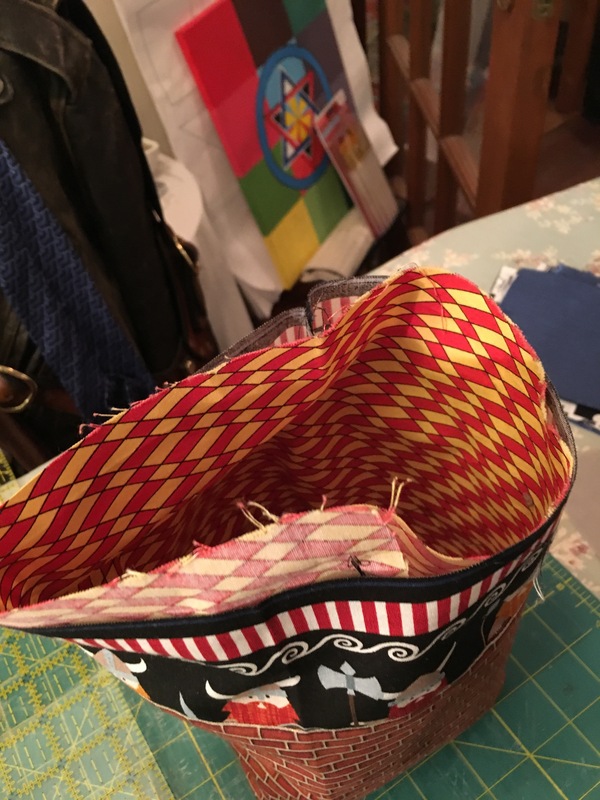 There’s a lot to be gleaned from making a quilt to keep a baby warm, or from making a bag like a tower for holding a bottle of wine or something similarly fragile and precious, or a bag that looks like a pencil case. There’s a place for unbridled creativity. But there’s also benefit to knowing how to do something the right way. I mean, think about it. In a tailor’s shop 500 years ago, an apprentice would have to work on a variety of tedious projects — sharpening scissors, ironing fabric (I can’t imagine how difficult that work was before electric irons), measuring clients (and then measuring them again when the measurements proved wrong), learning to sew straight seams. They would have made a variety of things that no one would care if they were slightly off — bags with drawstrings, bags with handles, awnings for market stalls, aprons for the shopkeepers, tool rolls for traveling workmen, sacks for flour, and similar projects. These are a vital and necessary part of the learning of any artisanal technology, be it sewing or woodworking — the cruddy projects that no one really wants to do but that are genuinely vital to the good functioning of that sort of society. Thirty years after my own first sewing experiences in a Home Economics class in 8th or 9th grade, I find that these skills are returning to me with some rapidity. I’m much more skilled at whipping up a bag or an apron than I used to be, in part because I’ve trained those skills to a level of complexity and skill where it’s easier to just do it. I’ve learned a good deal of the apprentice work of this business of sewing (maybe not everything, because every so often I encounter a challenge that I have to go to a YouTube video to solve). But that’s what the Walking Foot was about. That’s what making potholders was about. These aren’t “stupid projects” but the foundations of the craft. In carpentry it’s probably smoothing boards; in bookbinding it’s folding and punching pages; in fabric it’s making potholders and bags. What are the foundations of your craft? When did you feel like you went from being an apprentice to being a journeyman or journey woman? When did you become a master of your art form?